The Dessert Bar is combining two of our favourite things – desserts and alcohol. They’ve got a whole menu dedicated to boozy delights that should definitely be on your radar. The Dessert Bar was started by Sanjana Agarwal, a finance and data analyst armed with an MBA, who was inspired to start baking by her mum. We’ve seen a lot of places doing boozy desserts, but these guys are solely dedicated to creating heady, delicious desserts with their unique combinations. Their range of drunken cupcakes is what first grabbed our attention. 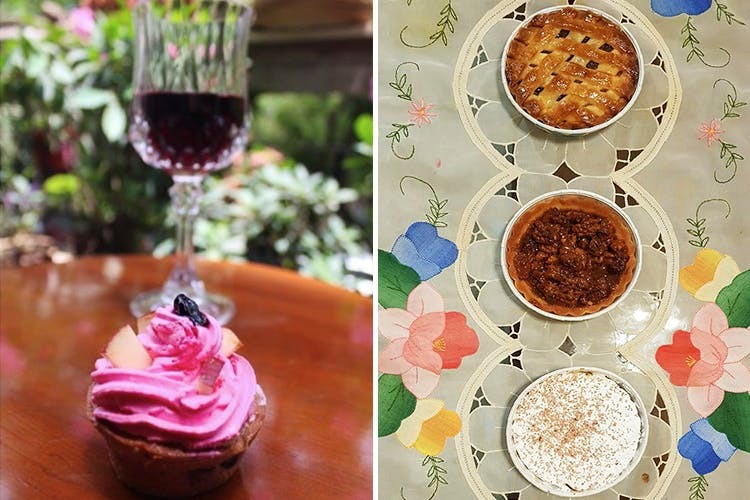 They have stuff like Sangria, Pina Colada, Lime n Vodka, Old Monk and Choco Chip, Bailey’s Coffee – and something called a Triple Chocolate Jack Daniel’s cupcake that sounds so good, we’re willing to sacrifice our summer bodies for. Moving on to cakes, they’re doing a vanilla cake that’s been infused with Kahlua and vodka, and if you swear by Red Velvet, they’re doing one with red wine. For all of you who want regular versions of their cakes, they’re available as well. We recommend you order their pretty mirror cakes, they look almost too nice to cut into. They’re also doing some really nice pies, we hear good things about the Pecan and Hungarian Walnut, but it’s up to you to decide. You can check out their Instagram page to see their stuff. They’ve only recently started selling, so you can contact Sanjana at 09810137161 to place an order.